Harold L. Ickes, “Harold L. Ickes,” Histories of the National Mall, accessed April 23, 2019, http://mallhistory.org/items/show/408. 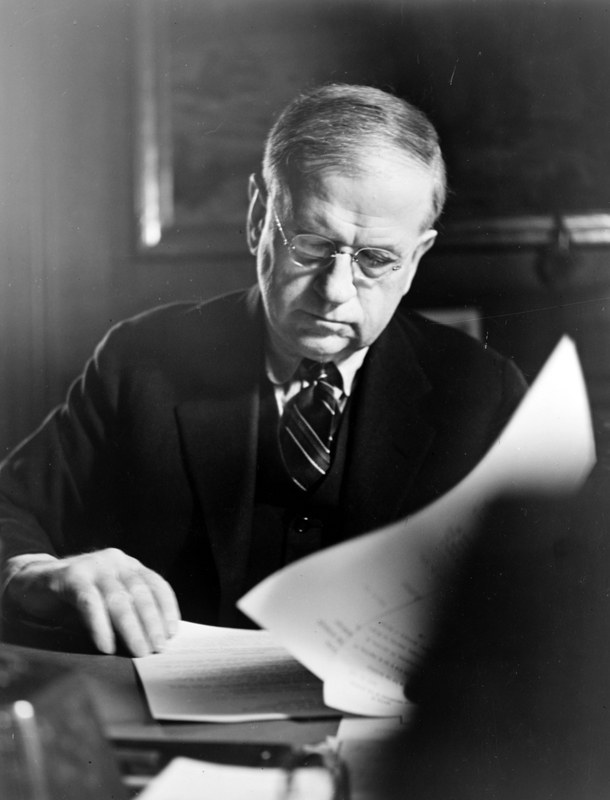 Harold L. Ickes was the longest serving Secretary of the Interior to date, holding the post for 13 years from 1933 until 1946. He supported civil rights for African Americans, desegregating the Department of the Interior, including the National Parks, during his time in office. He helped facilitate Marian Anderson’s 1939 concert at the Lincoln Memorial on Easter Sunday, arranged after the Daughters of the American Revolution refused to allow the African American opera singer to perform in their segregated concert hall. After earning a B.A. from the University of Chicago in 1896, Ickes became a journalist in that city, working for the Chicago Record and the Chicago Tribune. This job fueled his interest in politics, particularly the fight against corruption. After eight years, he returned to the University of Chicago, this time earning a law degree in 1907. In 1911, he married Anna Wilmarth Thompson, a widow with an interest in politics and American Indian affairs. He served as her campaign manager when she successfully ran for a seat in the Illinois General Assembly in 1928. In 1932, Franklin D. Roosevelt asked Ickes to work on his presidential campaign. After Roosevelt won the Presidency, he appointed Ickes as Secretary of the Department of Interior in 1933. Ickes would hold this post for the next thirteen years. He was greatly involved with the New Deal, heading the Public Works Administration (PWA) and working closely with the Civilian Conservation Corps (CCC) in the National Parks. Ickes was a avid conservationist, establishing or completing Everglades, Great Smoky Mountain, Shenandoah, Olympic, Kings Canyon, and Jackson Hole National Parks during his tenure. He was also an open supporter of African American civil rights. In 1932, he had headed the Chicago NAACP. He desegregated the Department of Interior, and thereby the National Parks, and helped arrange for the appointment of the first African American federal judge, William Henry Hastie, Jr. Ickes was also an advocate for the rights of American Indians and was opposed the internment of Japanese American citizens during World War II. Ickes resigned in 1946 because of a number of conflicts with the Truman administration. For the rest of his life, he wrote columns for national newspapers and worked on his memoirs.